Ready to take this for a spin? The three dimensional screen of the Nintendo 3DS really captures the immediate and visceral thrills of aerial combat and ACE COMBAT ASSAUL HORIZON LEGACY is the perfect showcase for that. You can also check out six new screens below. Are you excited for this high-flying title? Meh, there's Star Fox for this. I might pick it up if I have enough money. So the second analogue will stay exclusive to Japan ? This looks pretty decent, if it has (decent) online play I may have to look into this! the trailer showed gameplay footage which didnt look like a typicall ace combat game so i am not hyped anymore for this game. "touch-screen targeting and added control mechanics to dogfight and perform aerial acrobatics with ease"
Could be good. I doubt Namco would do a Ubi and put out a pile of stinking you know what for the 3DS version. The circle pad add-on is supposed to be compatible for this game, right? Yeah, I know it's optional but I would like the opportunity to try it out. Brings back memories of F15 Strike Eagle II on my old Tandy computer, back in the dark ages. The 3DS library is going to seem a lot more robust by the end of the year, that's for sure. I'm really looking forward to this game, but online play would definitely bump this up to a day one purchase for me. When I was looking at the screen shots the phrase "Highway to the Danger Zone!" kept repeating itself in my head. This is a must buy for me! There's two typos (promises and assault) . This game seems pretty cool, though I already have Starfox, so I'll have to see how much money I have when this comes out. Gyro? Online? I want details! Really? 4 days from zelda? Bad move. Which November game am I getting? Not this one, Mario 3D Land! Guys, Pilotwings and StarFox are very different from this lol. Why does /amazon says it is going to be released on 6 December? Star Fox isn't enough. Need more games. I will get this Ace Combat game. If this has online, I'll pick this up along with Star Fox. That is huge and this is supposed to be a good franchise. I agree with @Darkgamer that one's a arcade flight game, the other is a sim. Yeah LOL at the people saying I already have star fox. This game is 10 times more intense then star fox. Just the speed alone makes it more intense. This game also looks very good. 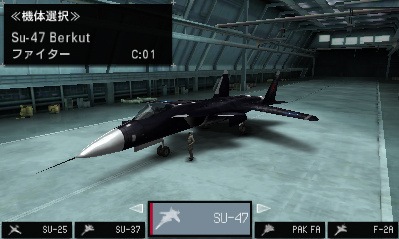 Haven't played ace combat in years though so it should be a fresh experience! The big reason I'd consider this over Star Fox is, frankly, I've already played that to death on the N64 back in the day and on the Wii's Virtual Console. I also liked the Ace Combat series on the PS2, so this could be fun. I'd like to see more info when it's made available. This is probably my most anticipated third party 3DS title coming out this year. Cant wait for some 3D dogfights!!!! !